I've written about Barrington Gifts in the past and my love for their stylish and practical tote bags remains just as strong as ever. 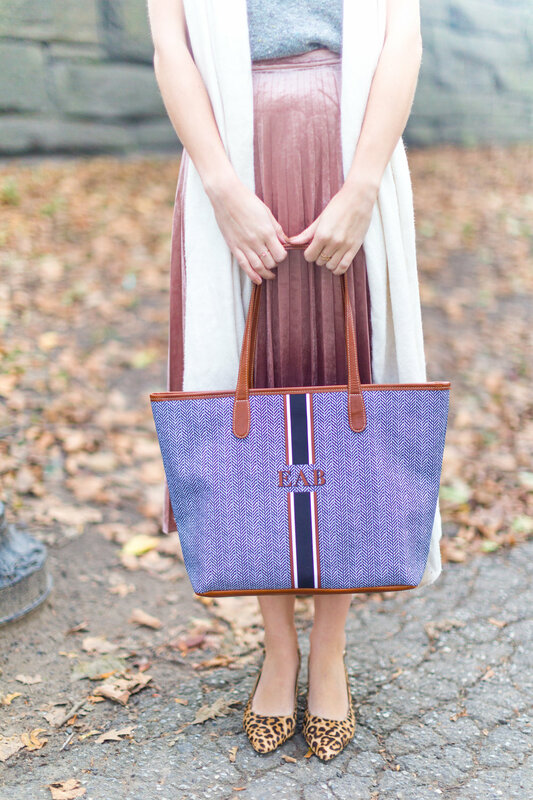 I carry my Savannah Zippered Tote just about everywhere and I love the new Fall/Winter '17 patterns that are available to customize for a variety of products. In addition to a new Savannah tote, I also recently got a matching Eyeglass Case and a Cosmetics Case with my monogram on them. It's a great set for everyday use or for when I travel to keep all my essentials organized and safe. I also own a very summery pink St. Anne Tote, which is currently available in some great tartan plaid and various patterns more suited to the fall and winter aesthetic. My favorite thing about the tote is that in addition to being fully customizable so the style fits my look, it has a ton of pockets and sections that let me keep my belongings a little less cluttered than just throwing them into the bottom of a bag, and it zips up to keep everything safe as I walk around the city. You should definitely check out Barrington as the holiday season approaches because they make great gifts--it's literally in the name--for so many people on your list. I got my mom a tote about a year ago and it's one of the only bags I ever see her carry!